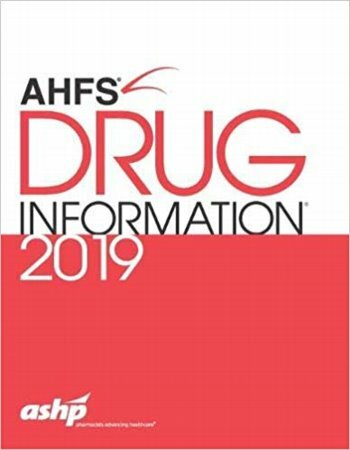 Subject Definition: Pharmaceutical Preparation-U.S.; Formularies-U.S.
Abstract: With extensive updated information on everything from treatment of hypertension to orphan drugs, AHFS Drug Information, 2019 Edition is a necessary addition to your pharmacy's resources. 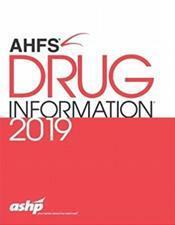 With expanded and revised content supported by more than 92,000 references and incorporating the advice of numerous subject matter experts, AHFS DI helps you protect your patients and your practice. It's the only print compendium designated by the U.S. Congress, the only compendium published by a professional and scientific society, and is the reference that has been trusted by pharmacists and other healthcare professionals for over 60 years.